As educators, we want to know how to enhance students' intrinsic motivation to change and achieve in the academic, career, and social/emotional domains. Receive an introduction to two evidence-based practices: motivational interviewing strategies and the trans-theoretical model of change. 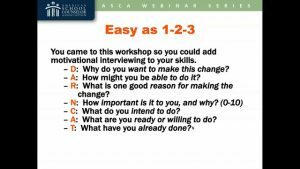 Walk away with skills and resources to elaborate, affirm, reflect and summarize change talk into your practice. Download accompanying handouts. 1. Discuss fundamental conditions necessary to elicit change talk. 2. Use the style and spirit of listening required to motivate students to change and achieve. 3. Ask open-ended questions to elicit willing to change talk, able to change talk and ready to change talk. 4. Affirm, reflect, and summarize change talk.